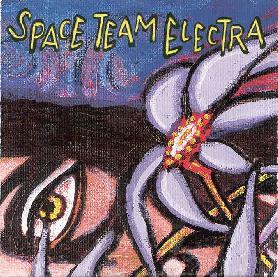 Space Team Electra - "The Vortex Flower"
Based in Denver, Colorado, Space Team Electra plays music that is sometimes crushing, guitars crashing to create an impenetrable sonic wall of sound... while at other times being dreamily melodic. What all these tracks do have in common though is that they are songs, and lyrically intense songs at that. The band consists of Myshel Prasad on vocals and guitar, Bill Kunkle on guitar, Kit Peltzel on drums, and Greg Fowkes on bass. Being a fan of music that explores and develops I'm struck by how Space Team Electra's music often does precisely that while always stopping short of overshadowing Prasad's vocals. It's been some time since I was able to groove along with good jamming music while simultaneously reading the lyric sheet. "I am gruesome I am pure, I am too much to endure, I am flying without strings, I'm too much of everything". These words from "Shadow" jumped off the page at me and prompted me to pay attention to more than the music which I have a tendency not to do. My favorite tracks are the more intense ones in which the music strives for volume and passion and Prasad's vocals do the same. "Dazzle" is a wonderful track that blasts into a toe tapping space rockin' psych heaven with some great acidic guitar moments. The heavy parts have that sonic layered sound but aren't noisily overwhelming. As Prasad says, "While our live sound often coalesces into an enormous sea, we attempted to really separate and crystallize everything on the record, to control the layers, make it all more subtle and at the same time, more stark." There are indeed some seriously cosmic musical moments here. For example, "Lucifer's Tongue" is a short feedback-heavy, pulsating and erupting instrumental track. And "Oasis" starts with Myshel singing a short verse against a heavy drum beat and then launches into brain splitting guitar blazing anguish. This is the track that demonstrated for me that both lyric and music can achieve the same emotional level with Space Team Electra. Speaking of which, "Isabel" is a great finale song which alternates between easy going verses and intense vocal/instrumental passages, and is possibly the most vocally powerful song on the album. The song really has a majestic feel. But wait... did I say this was the last song? There are 99 tracks on this CD! Well, the 13th is a freaky spaced out electronic bit and the rest are the same 6 second drone repeated over... and over... and over. I listened to every one waiting for the big hidden track. Got me! In summary, Space Team Electra should appeal to those who like both cosmically intense guitar driven rock and well written melodic songs. Lots of stuff here that is radio friendly and would in the process surprise the masses with music that is actually good. A note to the band: "Dizzy" is your hit single kids! You can visit Space Team Electra at their web site.